SPOILER ALERT: In years past, the “LOST” filming schedule would stretch to six days a week only occasionally, and usually as days run out toward the winter break or the season finale. But things for this final season seems to be especially intense, as we’ve already seen a few Saturday shoots even though we’re only a few weeks into production. And yesterday, two separate units were working on opposite sides of town. 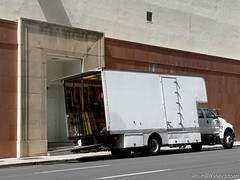 The first shoot was in downtown Honolulu. 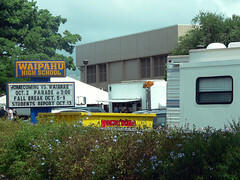 “LOST” fan and HPU student “Alevermor” caught the set dressing crew at work off Alakea St., in the largely vacated back offices of Hawaiian Telcom, on Friday. A friendly crewmember told her that the Saturday morning shoot would be behind closed doors, but that Terry O’Quinn (Locke) was the scene’s central star. A report from TVOvermind today suggests that Billy Ray Gannon was also there, reprising his role as Locke’s box company nemesis, Randy Nations. Locke and Ben, off island, in what appears to be a post no-crash scene? And with Entertainment Weekly‘s Michael Ausiello revealing the title of Episode 6×04 as “The Substitute,” I think one or both of these gentlemen may be working in education — wherever or whenever they are. Updated 5:05 p.m. HST: According to a Twitter post from Kurt Sutter, husband of the actress who “LOST” fans know as Locke’s lost love, Helen Norwood, Katey Sagal in Hawaii right now. A separate account, @kateysagal, also mentions being in Hawaii. Might the Locke and Helen story get a different ending? Love it….thanks!!! I can never hear enough LOST scoop! :) Have a great week!! Why is it that answers and scoop always mean there are more questions. Love hearing the scoop, but my mind reels with questions and all the posibilities. I hope Helen and Locke have better ending than her just being dead after dumping him in a parking lot. I never really bought the brain aneurysm story. Seemed a little too convenient….